Obituary – Moore, Homer Lee « Perry High School Alumni Association, Inc.
Moore, Homer Lee (Papa Homer), 89, of Wichita, passed away at home on January 26, 2015. Visitation will be held on Friday, January 30, 2015 from 5:30 – 7:30 P.M. at Downing and Lahey East Mortuary. Funeral services will be held at St. Stephen’s Episcopal Church, 7404 Killarney, on Saturday, January 31, 2015 at 11:00 A.M., followed by a private burial. Homer was born in Enid, Oklahoma and was raised in Perry. Just before graduation from high school, he took a competitive examination for officers’ training in the Navy. He received orders that he had been accepted into the V-12 program and after line officer training, he was sent to supply corp school at Harvard. Upon graduation, he was assigned as a supply officer to the carrier USS Attu. Homer enjoyed over fifty years in his profession. 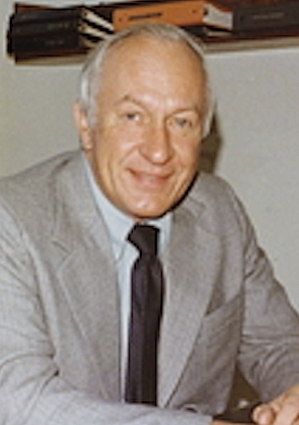 In 1955, he became a partner with Elmer Fox and continued through a merger with Grant Thornton, an international accounting and consulting firm. Homer loved to hunt, fish and travel. He was actively involved on the Metro Board of the YMCA for almost 45 years and, in 2005, was inducted into the Greater Wichita YMCA Hall of Fame. Homer and his family were founding members of St. Stephen’s Episcopal Church, reflecting his strong faith and respect for the dignity of all human beings. Preceded in death by his parents, W.E. (Ed) and Lydia Moore, his brother, Ed Moore, and his beloved wife of 31 years, Mary Louise, he is survived by “the Alligators” – Suzanne (Dale) Graham of Wichita, Bruce (Diane) Moore of Bedford, TX, Steve (Kristy) Moore of Leawood, KS and Beth (Randy) Salyer of Wichita; ten grandchildren, Chris (DiAnne) Graham, Lindsay (Jason) Munsell, Stephanie (Chris) Newton, Erin Moore, Michael Moore, Abby Moore, Jon Moore, Camille Moore, Patrick Salyer and Kaitlin Salyer; and one great grandson, Owen Graham. In lieu of flowers, memorials may be made to the Greater Wichita YMCA, 402 N. Market, Wichita, 67202 or St. Stephen’s Episcopal Church, 7404 Killarney, Wichita, 67206. A special thanks to the caring staff of Larksfield Place Independent Living and Harry Hynes Memorial Hospice.